"tSilentTime" prevents ringing phone at work and school. "tSilentTime" switches silent mode on or off automatically when your set time comes. You should set silent mode on at work and school. Usually, You switch the silent mode by manual. But, your phone ring unexpectedly if you forget silent mode on. tSilentTime prevent you forgetting silent mode setting because of switching mode automatically. Switches silent mode on or off when the set time comes. Display tSilentTime running status and silent mode on-off time information. 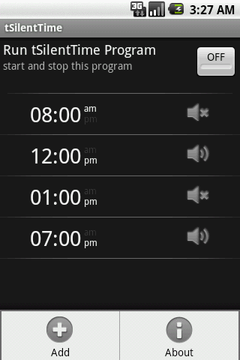 To enable tSilentTime, "Run tSilentTime Program" button is switched on. To add silent mode on-off time information, press "menu" and "Add". 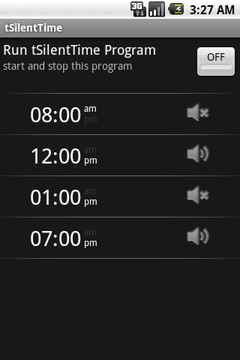 Set the silent mode on-off time information, press "Save" button. When edit silent mode on-off time information, select an item from list and change the entry. When delete silent mode on-off time information, touch and hold a delete item. Select "Delete silent time" and press "OK" button on the delete confirm dialog. Download from GooglePlay Store "Applications -> Tools "
Can be changed 12-hour/24-hour format? Go to android's date format setting("menu"->"Setting"->"Date & time setting"->"select date format") and change "Use 24-hour format" setting. Does tSilentTime use much battery? tSilentTime needs little battery to run. 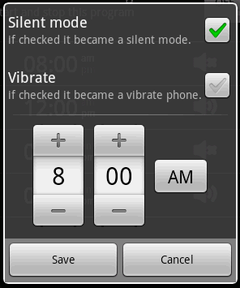 When silent mode on-off time comes, tSilentTimes is started and switches on or off. After completes switching on-off, tSilentTime will finish immediately.